Despite previous repairs carried out by the Trust, the Abbey Church is now a dangerous structure, and is closed to the public for the foreseeable future. Although the former Monastery with its gardens and approach road are private property, there is a pedestrian right of way along the front of the Monastery as far as the ruined church. Cars may be parked on the verge of the road near the river bridge at Capel-y-ffin; alternatively, there is a small car park opposite the Memorial Calvary which is the property of the Grange Pony Trekking Centre, and cars may be parked there for a small fee payable at the Grange. Directions: From Abergavenny, take the Hereford road (A465), and then take the left turn signposted Llanvihangel Crucorney. Immediately past the Skirrid pub, turn left towards Llanthony. 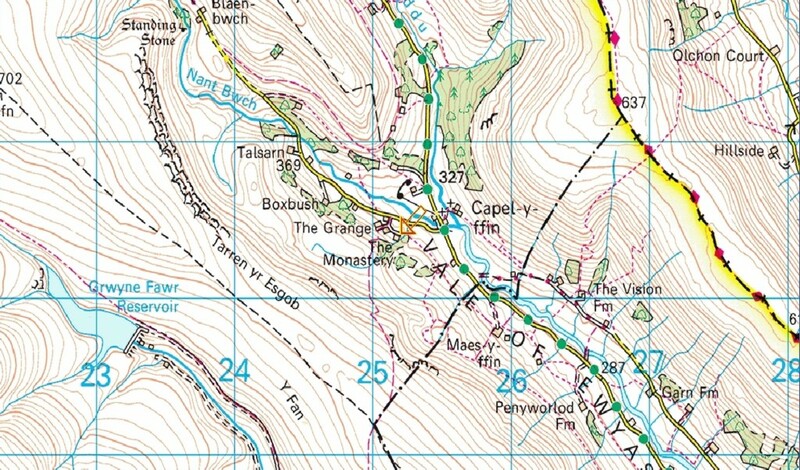 Pass through Llanthony and follow the sign to Capel-y-ffin. Take the immediate left at Capel-y-ffin, continue for approximately ¼ mile, then turn left and follow the road around to the Monastery.